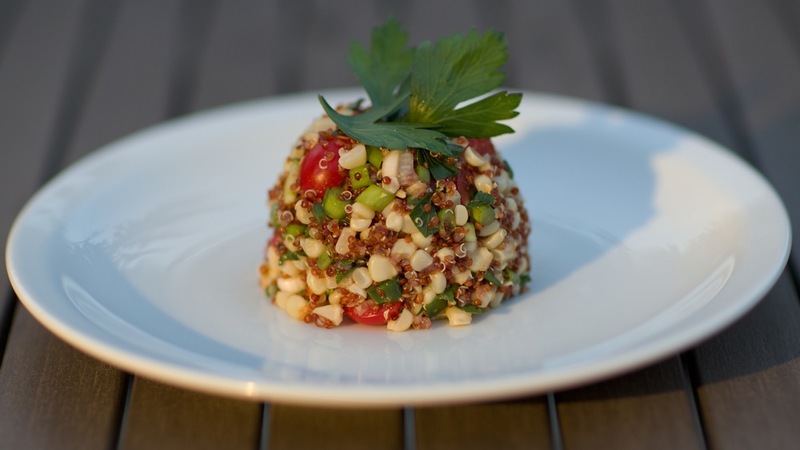 Quinoa Tabbouleh is one of my favorite salads. It's easy to make and to make ahead. Try it with chicken or some grilled lamb. Rinse the quinoa. Bring quinoa and the water to a boil in a medium saucepan over high heat. Reduce heat to medium-low, cover, and simmer until quinoa is tender, about 10 minutes. Remove from heat and add salt to taste. Let the quinoa stand, covered, for 5 minutes. If any more water remains, drain it. Let the quinoa cool. Cook the corn and cut it of the cob, if you use fresh corn. Set aside to cool. Whisk lemon juice with cumin, garlic and oil. Season with salt and cayenne pepper to taste. Chop the scallions, cucumber and tomatoes. Mix it in with the quinoa, and drizzle the dressing over.